Here is what the input_select looks like in the configuration files and the .zip files (except for the new ‘info’ options at the end. I’ve been having problems with input_selects where selecting an option is not registered if it is the one that was previously selected. I may setup a lovelace glance card with a tap_action to do some of these things. I wonder if needs quote marks around the text. The DSZ will not change if you are in a zone, it will only change if you are not_home and have not moved for several polling cycles. Then the DSZ will be updated with those coordinates. I changed the default zone when HA is restarted from 0,0 to 0,180 (international date line and the equator). The Zone entity has a passive option the will prevent it from showing up on maps that I want to look at. I’ve noticed on ha 86.1, I trigger a call to input_select as the page loads. This doesn’t happen in states (non-lovelace) mode. I’ve installed your latest version. I’ll let you know how it goes. I’m thinking of switching lovelace to yaml mode. I’m trying your pre-release version, and it is looking positive! Removing that nasty loop is a lifesaver! I’m using 2fa. Does this mean I’m not able to use this component? 2FA can’t be disabled once enabled. I’ve tried creating an app-password but nothing is happening. No errors, nothing. @gcobb321This is great! Question: The repo says that the code doesnt support two factor auth… Are there any plans to shift the code to use the app-specific password? I’m using 2fa (homekit requirement) and icloud3. I’m not using 2fa on iOS HA client. I didn’t make any changes to the 2fa code base used by the HA iCloud component other than making a few of the pop-up notifications window better looking. The pyicloud python program is what actually does all the work. Go here to read about it. I also use 2fa with my Apple iCloud accouht. The same goes for me. That’s why I asked. @gcobb321 Thanks for the feedback. Guess I have to figure out why my setup isn’t working, asking for MFA codes and not throwing errors. HA 86.2, icloud3 pre-release v86.1, My wireless is pretty solid. I was just about to ask if it was possible to use the component to play the lost sound without using the device tracking part of the component. Seeing you comment reminded me that my hacky way recently stopped working (a php script) so maybe something is wrong on apples side. @Byeartem - Thanks. Fixed typo. @GaryK - Fixed format errors on ‘time’ fields. Possible problems when issuing commands for a specific device with more than one icloud account. Errors updating a device when the location information is old. An error message is written to the log file and the device is repolled constantly retried without successfully relocating the device. The iCloud3 zone state was capitalized’, i.e., school went to School, HOME went to Home. The zone’s name as it is in zone.yaml is now used without any reformatting. If the location data was ‘old’, an “Error updating device_name” message was displayed in the log file due to inconsistent data. Additional error checking has been added. Devices in a zone were repolled via Find-my-Friends if another device on the account needed to be repolled. If the device in a zone (that didn’t need to be repolled) was experiencing poor GPS accuracy, that lead to device location errors and it would potentially drop in-and-out of the zone until the GPS accuracy was restored and may get into a relocate loop for several cycles. Now, the device in the zone will only be updated if there were no GPS accuracy issues. How would I add a passive option to dynamic stationary zones to maintain map focus to my local area? Also, are you interested in seeing log output on the latest release? I need to change iC3 so it sets passive: True when setting up the stationary zone and when exiting the zone. Also need to set it to False when it detects a person is in the stationary zone. Hope to do that today and try it out this pm when i’ll be away for a few hours and not in a zone. Send me the log ([email protected]) and I’ll check for uncaught errors. Mine ran all night on a 1-min interval and no old locations data from icloud fmf. @gcobb321 Would you happen to know why my location would drift while i was in my home zone? 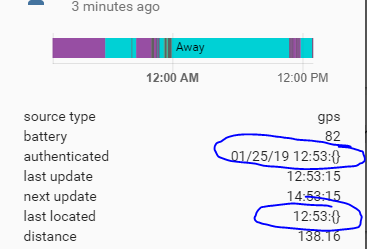 As you can see, while i was asleep at 2AM and 4AM, I drifted from home to away exactly 2 hours apart. It also happened 3 times prior… I used all the default settings but I just cant figure out why it says I leave my house when i’m on my couch. My SO didnt enjoy the automations it ran at 2AM and 4AM lol. @CauseFX I would suspect that the device went to sleep and had dropped off the network. When the end of the 2-hour inzone polling time elapsed, iC3 rechecked the location and set it back to home. It’s been my experience that that other device_trackers (netgear, nmap, owntracks) also set it to away when it goes to sleep and drops off the network but those components don’t seem to reset it back to the home zone. On my setup, I have a ‘driving_flag’ input_boolean that is set to true when I’m 1 mi from home. I check it when I arrive home and don’t run the gary_arrives_home automations. See the sample scripts in the configuration folder of the repository. You could also set an input_boolean with an automation that sets it to true when away more than 1 minute and resets it to false when back home. Then check that in your arrive_home automations and scripts. hmmm, that is odd as this has never happened before… I literally just installed ic3 yesterday around 4pm… both ic3 and ha iOS app have the same device tracker id.